A lot of people have been divided over this one. I can see where the not so positive thoughts have been coming from. It is incredibly slow in getting toward the actual paranormal aspects. 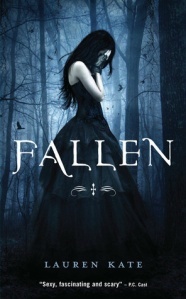 So if you’re looking for a hot paranormal romance, you might find yourself disappointed for the first 350 or so pages. I admit, I was disappointed at first, but after getting into the story and taking it for what it was, I actually started to enjoy myself. Boarding school stories can get tiresome, but this one was a bit out of the norm. Accused of burning her boyfriend to death, Luce is sent to a reform school in the middle of nowhere. Although Luce is one of the more tame students amongst the many delinquents trapped there. She quickly attracts an array of friends, Arriane, a tough girl who sees Luce as her pet project, Cam, a boy who takes to her, making his feelings incredibly obvious and Penn, a girl who attends the school by choice rather than by court order. But even with all of these friends, Luce is constantly chasing after Daniel, the guy who flipped her off the first minute he saw her. To me, I felt like the prologue was unnecessary. It did help set up the paranormal plot, but the way it was written was just confusing and also a little spoilerish. I wish I’d skipped it actually and dug right into the story. I’ve read a fair few books set in boarding schools, so they can start to feel repetitive after a while. This book does cover just about all the bases: first day jitters, crushing on hot guys, getting off on the wrong foot with teachers, mind-numbing classes, aeroplaning notes behind the teacher’s back, detention, school socials, parents’ day, dorm parties, and mean girls who are mean just for the sake of it. But what sets it apart is the fact that Sword and Cross is more like a prison than a school, which I found that to be a lot of fun. Here we’re met with wire fences circling the perimeter, little cameras zooming in on the students on nearly every inch of the school, and a strict ban on all forms of enjoyment. The details are what make it fun. The school has its own cemetery, where detention happens to be held. The teachers are also mysteriously androgynous. I especially love this school’s take on free dress. Students can wear whatever they want, that is, as long as it’s black and conservative. I was a bit annoyed by Luce’s apparent immediate obsession with Daniel. Particularly since he’d been nothing but rude to her since she met him. Add to the fact, that another guy, equally cute, and incredibly nice, actually shows an interest in her. But no, Luce ignores him and practically stalks Daniel, Googling his name in class, searching through school records (Hush, Hush anyone?) and sneaking after him at every chance. I get that she’s attracted to him, but if I were Daniel, I’d think she were crazy. What surprised me about this book though, was the seriousness of the action. I’d like to see how Disney go about making this into a movie. Around three quarters into the book, the high school plot takes back seat and the paranormal comes out in full force. It’s obviously an angel book, meaning characters are occasionally prone to sprouting feathery wings. Once the main character starts piecing it together, that’s when I really got hooked. Aspects of the plot remind me a lot of Elixir by Hilary Duff, but only executed a lot better. This one was published first anyway. Daniel’s actually really likeable even with his hot and cold persona. Things fitted together quite well and I’m really happy that my copy of Fallen came with an extra chapter at the back, with their first meeting from Daniel’s POV. If your copy has this, I recommend leaving it until the end though as it’s heavy with spoilers. There were a lot of twists, some of them more obvious than the others. I was still caught off guard by some though, which I love when that happens. Don’t let yourself get bogged down in the early parts of the book. Race through it as there’s plenty of potential. There are lots of answers given, but enough kept hidden for the next book. I can’t wait to start it. Don’t go into this expecting angels galore and you’ll be happy. Fans of high school drama with a slight twist should like this. I love this review! Very concise and straight to the point. and I totally agree with basically everything you’ve said about it. I was very shocked it took about 300 pages for some paranormal “activity” or romance. Of course there were little flings of romance here and there but not very strong, and Luce is slightly annoying as well how quickly she fell for Daniel. You’re so right! At first I was dissapointed as well, until Luce began to find out about Daniel being an angel. I especially loved Cam as a character, it’s a shame he’s only mentioned a few times in Torment. But your review describes exactly how I feel about this book.